Opening hours: T–Th 2:00 p.m. – 6:30 p.m. and Sat 11:00 a.m. – 4:00 p.m. In the exhibition Experiments, Jochum Rodgers brings together unusual design objects from the 1960s and 1970s. As the exhibition title suggests, the impulse behind the choice of exhibits was less the objects’ function than an urge to test out and explore. On display are a selection of design objects – primarily lamps and furniture for seating – by a range of architects, designers, and artists. Some examples include the sculptural Rampa furniture by Pier Giacomo & Achille Castiglione, which merges in a small space the functionality of a writing desk and shelves. In spite of its playful character, it follows functional design principles. Pietro Cascella’s design for a floor lamp made of solid wood allows the lamp’s height to be adjusted up or down by three meters, facilitating a complex spatial experience. Cascella’s emphasis on material texture reflects his involvement with the artistic movement Arte Povera. With its futuristic appearance, Joe Colombo’s Sella 1001, a plywood lounge chair whose lacquer coating gives it a synthetic impression, is considered a work of “Space Design”. The availability of new materials also inspired experiments in the formal language of design. Studio Tetrarch, an Italian architects’ collective, used fiberglass-reinforced plastics to manufacture their Tovaglia table. 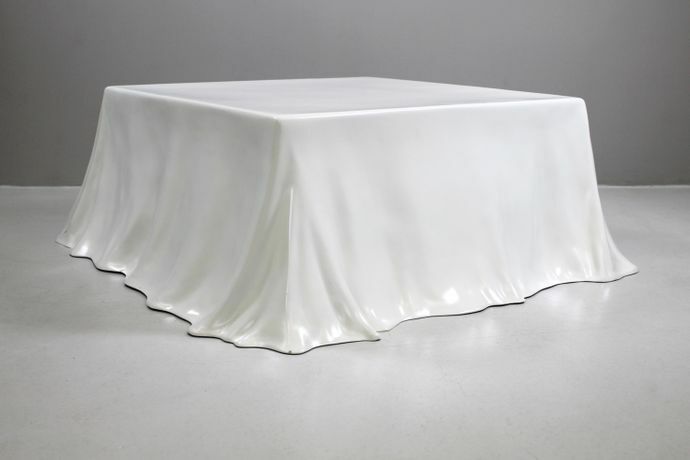 Cast in a mold, the motif of a floor-length white tablecloth (tovaglia) takes the form of a surreal-looking table. At the exhibition, on view until 6 June 2017, visitors will encounter a selection of objects by Joe Colombo, Pietro Cascella, Gianfranco Fini, Pier Giacomo & Achille Castiglioni, Frank O. Gehry, Piero Gilardi, Hans Gugelot, Gruppo Archizoom, Gruppo A.R.D.I.T.I, Ennio Lucini, Hans von Klier, Angelo Mangiarotti, Gino Marotta, Casati Ponzio, Gino Sarfatti, Ettore Sottsass, Studio Tetrarch, and Superstudio.